March 10, 2014 by iCepts Technology Group, Inc. The Microsoft Dynamics NAV Web client has been restyled to a modern style look and feel. The ribbon can be hidden in just one double-click. Choose one of the ribbon headers, for example, Actions, and double-click to hide the ribbon where you need more screen real-estate. Parts of the navigation pane; Home, Posted Documents, and Search for Page or Report have moved to the top of the page as part of the new styling of the Microsoft Dynamics NAV Web client. It is now possible to create a new record from a lookup on the Microsoft Dynamics NAV Web client. When, for example, creating a new sales order and adding new lines, creating a new item record from the item look-up is possible. Filtering on worksheets is now working in Microsoft Dynamics NAV Web client. When filtering on reports, for example the customer top 10 list, there are now look-ups available to help filter the result. Filtering with multiple filter lines in lists is now also possible in the Microsoft Dynamics NAV Web client. In lists and worksheets with columns that have checkboxes, the user can now select and clear a checkbox with a single click. The Microsoft Dynamics NAV Web client now shows tooltips for all fields, when you hover over a field. If you choose the tooltip, the Help for the field opens in a new browser tab for the Microsoft Dynamics NAV Help Server. Error handling in Microsoft Dynamics NAV Web client is improved. The error message will stay at the top of the page, even if you scroll on the page. It is now possible to attach a note or link to a specific record, such as a customer or an order using Record Links and Notes in the Microsoft Dynamics NAV Web client. 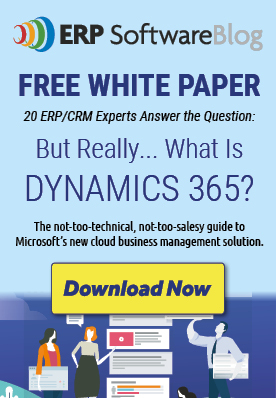 Get a Free Estimate On Microsoft Dynamics NAV here.